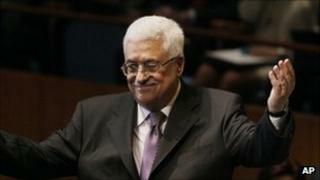 Palestinian leader Mahmoud Abbas has reacted coolly to a blueprint for talks put forward by international mediators. Mr Abbas said he was studying the so-called Middle East Quartet's idea for peace talks to open within a month, but ruled out any plan that did not demand an end to Israeli settlement building. He was speaking to reporters while flying back from the UN in New York. Mr Abbas submitted a bid for United Nations recognition of a Palestinian state at the UN General Assembly. Addressing the delegates on Friday, he urged the Security Council to back a state with pre-1967 borders. "The time has come for my courageous and proud people, after decades of displacement and colonial occupation and ceaseless suffering, to live like other peoples of the earth, free in a sovereign and independent homeland," he said. Afterwards the Quartet of mediators - the US, the UN, the European Union and Russia - called on Israel and the Palestinians to resume peace talks within one month and aim for a deal by the end of 2012. Direct talks between Israel and the Palestinians stalled in September 2010. The Palestinians walked out in protest at the building of Jewish settlements in the occupied West Bank. Commenting on the possibility of fresh talks, Mr Abbas said on Saturday: "We will not deal with any initiative which does not contain a halt to settlement or the '67 borders." On Friday, Israeli Prime Minister Benjamin Netanyahu told the General Assembly that the core of the conflict was not settlements but the refusal of the Palestinians to recognise Israel as a Jewish state. The United States has said it will veto the bid for UN recognition of a Palestinian state if it comes to a Security Council vote.